Waterproofing, reinforcement and repairs of reinforced concrete structures, shotcreting, sales of materials. Представительство в Киеве, Украина ООО “Промбудгидросервис”, ул. Бориспольская, 6, оф. 373, тел. +380668201699. Waterproofing services, reinforcement of structures and sales of high quality waterproofing materials in the market. Execution of works of any complexity level, sales of waterproofing materials for buildings and structures (basements, swimming pools, parking lots, balconies, foundations, terraces, hydraulic engineering installations and tunnels), protection from moisture, fungus and mould. You will do the right thing if you approach us to order waterproofing of a private household or any building. We will be only too glad to fulfill the requirements of the most demanding customers. We guarantee individual approach to each client, fast and accurate cost estimation. -bentonite mats, cords, waterproofing mixtures; two-component polyurethane resins, Penetron and many others. We also offer you shotcreting services, drilling of boreholes in concrete, cutting with diamond tools and building materials for sale. We are going to provide information on every issue. Another direction of our enterprise’s activities is professional execution of sanitary engineering works of any level of complexity. Skilled personnel will lay utility lines and develop an individual design taking into account configuration of the construction site. designer swimming pools – we build swimming fools of any configuration, waterdrop-shaped, curved, etc. Shotcreting and anti-corrosion protection of concrete structures. We have extensive experience in this field. We use state-of-the-art technologies; the use of modern equipment allows us to meet the requirements of the most demanding client. We produce high quality shotcrete mixture which will satisfy any exacting customer. The use of imported materials, technologies and their analogs makes it possible to perform quality repairs and restoration of reinforced concrete structures. We are interested in establishing a long-term co-operation; we are prepared to provide comprehensive information, to give advice, conduct studies of sites and execute waterproofing works at an affordable price. High quality waterproofing services are rendered strictly within the stipulated period of time. In recent years we studied technologies pertaining to soil solidification, reinforcement of foundations and slope stabilization. Penetron – dry waterproofing mixture for concrete surfaces. Dry mixture consists of special cement, quartz sand of certain particle size, patented active chemical substances. 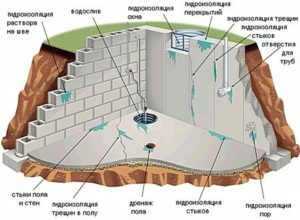 Penetron is the most widely used waterproofing mixture in Ukraine. Mapei (Italy): MAPELASTIC – two-component elastic water-resistant sealing compound for waterproofing of concrete, filling of microcracks, waterproofing of surfaces under ceramic coatings. LAMPOSILEX – quick-setting, rapidly drying grouting mortar used to eliminate water leakages, including leakages under pressure in basements, passageways, underground passages and so on. It is also used to waterproof joints of concrete hydraulic installations, sewerage systems, tanks, ducts, etc. CEMtoben CS-Plus bentonite mats (Germany), SilverSeal selfsealing sealing membrane (Germany) – protection against moisture in high-rise, underground and utility construction, as well as in tunneling. GiSiV (Ukraine) – compounds for repairs and waterproofing materials for concrete (penetration, sealing of joints and junctions, seals for elimination of water infiltration, etc. 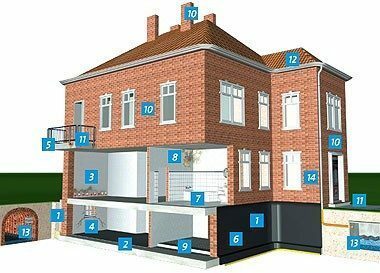 If you need reliable and affordable waterproofing of a private low-rise house or any other building (including commercial centers and production shops), we are prepared to deal with the task. The main field of our company’s activities is high-quality execution of waterproofing works. We ensure individual approach to each client and guarantee accurate cost estimation. Complete survey of buildings. We actively use a wide range of various materials which allow us to create reliable watertight membrane over foundation or any other architectural elements. Deep penetration compounds are characterized by strong adhesion which eliminates a possibility of capillary water infiltration into concrete. Watertight polymer-cement membrane, applied in compliance with the requirements of technological norms, has a long service life. It boasts high resistance to mechanical impacts, as well as other negative factors (including sudden changes in temperature of the environment and excessive humidity). When performing waterproofing works, specialists of our company use bentonite mats; dry mixtures; two-component elastic sealants; resins and many other materials. Waterproofing materials Buy. Buy waterproofing materials. We would be happy to have you as a client. Call us. Contact our consultants and they will give you comprehensive information on any issue that you might have. Waterproofing: Price is calculated for each individual project and depends on the commissioned task.